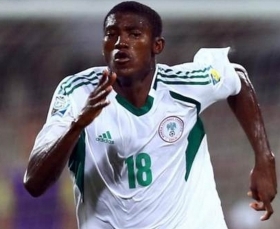 The 17-year-old forward Taiwo Awoniyi is one of Africa's hottest properties right now and both Man United and Man City are stepping up their interest in the Nigerian hotshot. Awoniyi plays for Kalmar in Sweden. According to rumours from Sweden, several Premier League teams have expressed an interest in the Nigerian striker but it is both Manchester United and Manchester City who are ready to trump their rivals to sign up the wonderkid Awoniyi. Awoniyi has already been compared to Nigerian legend Yakini and such comparisons have already boosted this young striker's profile across Europe. United and City will compete with Anderlecht, Lyon and Esperance for Taiwo's prized signature.